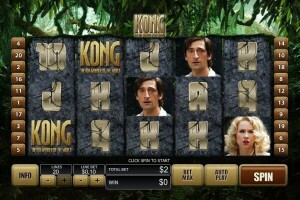 Kong: The Eighth Wonder of the World is a video slot machine developed by Playtech. The game is licensed and based on the 2005 King Kong remake directed by Peter Jackson and starring Naomi Watts, Jack Black and Adrien Brody. The game is available to play on SlotsClub.com, and you can enjoy it in either its free online slots mode or in a real money mode that pays out actual cash prizes. The movie is essentially split into two halves: the jungle of Skull Island and the jungle that is New York City. 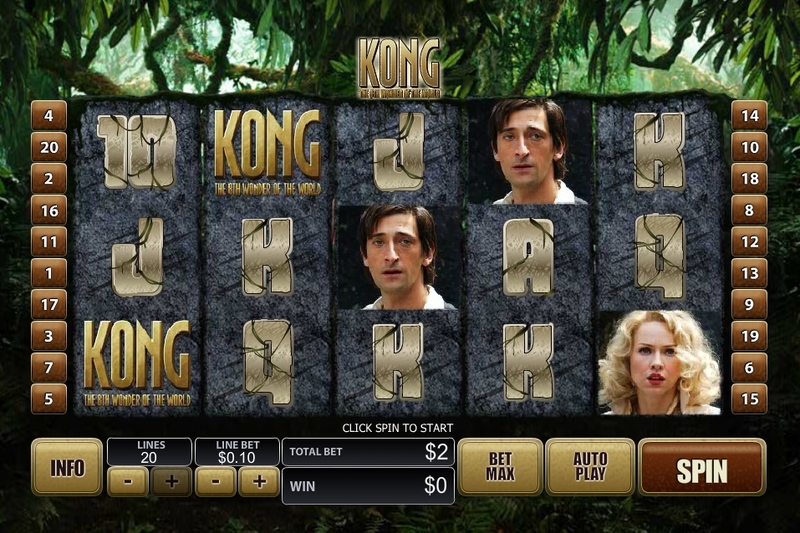 An aspect that makes the Kong slot machine memorable and sets it apart from other slot games is that it has two distinct modes to represent this. 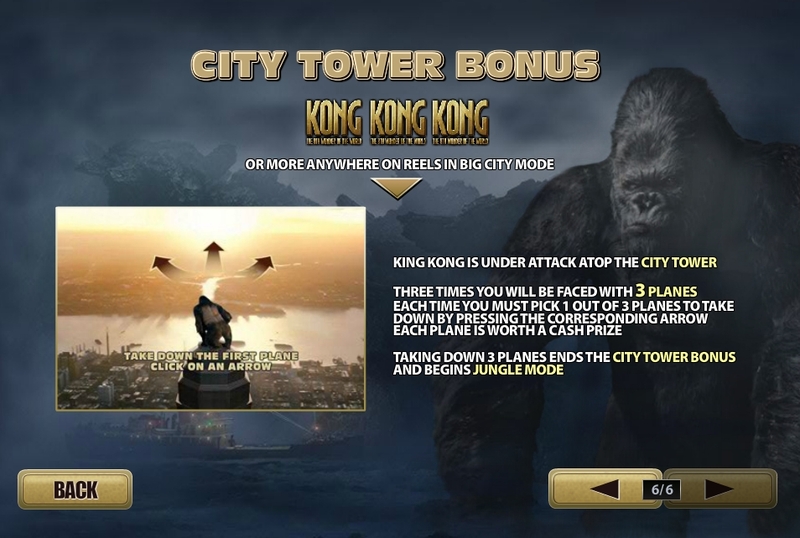 You’ll begin the game in the jungle, and once you’ve captured Kong and completed the Skull Island bonus, you’ll have to deal with Kong loose in NYC and complete the City Tower bonus. Kong bears a striking resemblance to the movie it’s based on and not just the story. After all, it actually uses headshot images of King Kong, Ann Darrow, Carl Denham, Jack Driscoll and Captain Engelhorn for its symbol set. 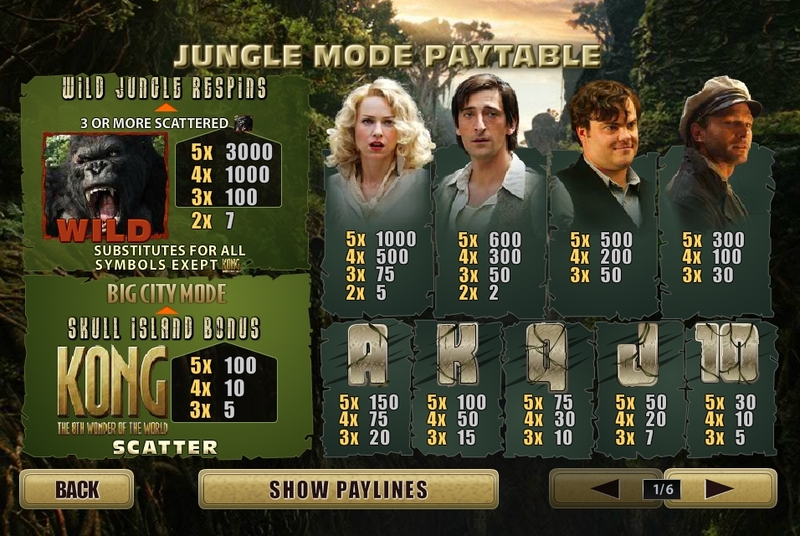 The game even opens with a video introduction that’s ripped from the movie, and the background shot for both the jungle and city are movie stills as well. There’s also a video straight from the movie that plays when transitioning from the city to the jungle and when completing City mode. The music seems original but authentic, and the sound effects are stellar and do a good job of setting the mood and building anticipation. There’s a particularly neat sound effect that builds up, like Kong pounding his chest, when a win is in the process of happening. The Kong symbol is both the jackpot symbol and a wild symbol that can substitute for any standard symbol. 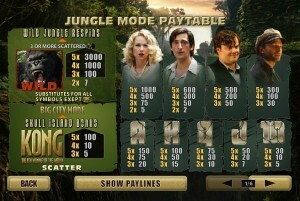 In addition, three or more Kong symbols anywhere trigger a bonus depending on the mode: Wild Jungle Respins in Jungle mode and Wild Kong Respins in City mode. Each Respin session provides three re-spins, and all wild symbols that appear are frozen in place until the session ends. The Kong logo is a scatter symbol, and three or more of them anywhere on the board trigger a bonus depending on the mode: the Skull Island bonus in Jungle mode and the City Tower bonus in City mode. 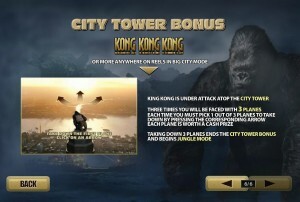 Both Skull Island and City Tower are bonus games where you choose three items. There are no bad choices. Each item reveals a prize, but the goal each pick is to find Kong, which reveals the largest prize of all. 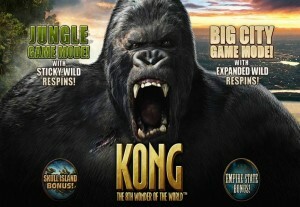 Kong: The Eighth Wonder of the World is one of those licensed Vegas slots that has stood the test of time. Movie-licensed games come and go but few are genuinely as interesting and fun as Kong is this far after release. Sure, some of that is due to the iconic nature of King Kong, but not all. This game is fun, has an excellent atmosphere, provides interactive elements and can pay out very well. Capturing Kong and reaching that transition from jungle to New York City is thrilling and really makes you feel like part of the story in this playtech online slot . Even finishing the story and returning back to the jungle to start over, if you’re lucky enough to get that far, is a blast. This aspect probably more than any other is what keeps people who’ve played Kong coming back time and again.